OAKVILLE, ON – Cameron’s Brewing is getting set to release a new sampler pack to select LCBO outlets. 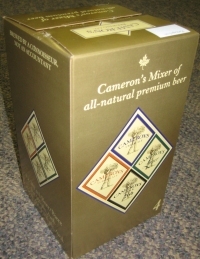 First launched at the December edition of their monthly Cameron’s Cask Night event at the brewery, the Cameron’s Mixer Pack contains a bottle each of Cameron’s Cream Ale, Auburn Ale, Lager and Dark 266 Lager. It will retail for $8.95 per pack.